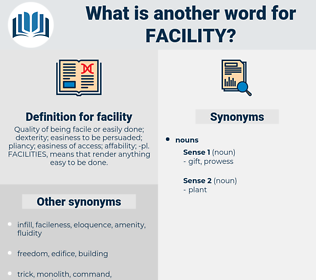 What is another word for facility? 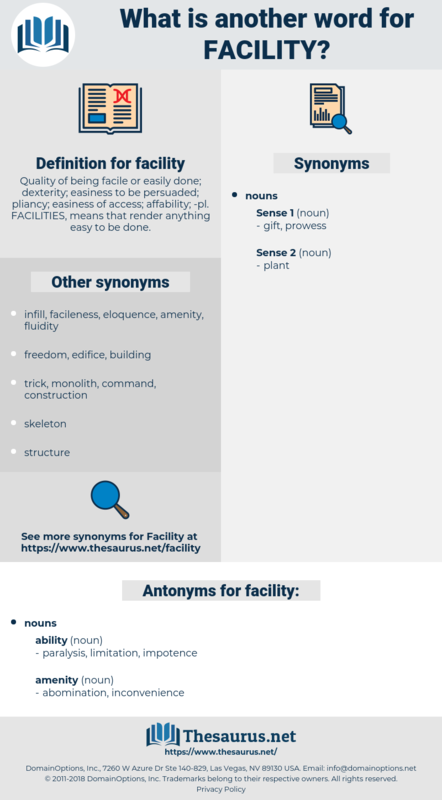 corporations, Measures, implements, Environments, Criteria, ISS, requirements, Houses, Elevators, barracks, Investments, annexes, holdings, fitments, fixtures, reasons, merits, mechanism, mechanisms, instrument, instruments, institution, institutions, factory, Factories, centre, centres. possibility, faculty, capacity, mechanism, instrument, instruments, opportunity, institution, ability, factory, inauguration, centre. Flagged, used, related, equipped, built, Provided. torment, botheration, torture, distress, exasperation, aggravation, bother, annoyance, irritation. incompetence, hardness, ineptness, inability, incapability, clumsiness, disinclination, difficulty, incapacity. vexation, disquiet, worry, perplexity, trouble, awkwardness, discomfort, constraint, uneasiness. It was a happy life, and he grew to like it better than any life he had led yet; besides, he improved rapidly, as his facility was great - for painting as for everything he tried his hand at. He talks English, French, and Danish with equal facility. foucault, fecalith, fizzle out, face cloth, facilitated, fusillade, facilitate, fasciolidae, faecalith, faculty. restroom, public convenience, wash room, public toilet, comfort station, convenience, toilet facility, public lavatory. water system, communication equipment, station, sewage works, transportation, athletic facility, assembly, menagerie, zoological garden, power grid, depository, meeting place, recreation facility, arboretum, source, gas system, power system, communication system, course, transit, repository, botanical garden, Depositary, sewage system, recreational facility, deposit, water supply, drive-in, grid, field, utility, landing field, cafeteria facility, transportation system, water, sewer system, backroom, flying field, military installation, airfield, range, zoo, forum.